Explicit CPR hosted by David Samuels Show 77 July 31 2018 guest Robert Cotto Jr.
Tonight Hartford activist Robert Cotto Jr. will join us to talk about the war on public education, and the drowning of Hartford teen Jaevon Whyte. David will analyze Russiagate, and how Blacks are being manipulated by white liberals to further a partisan agenda. Hear COMMUNITY PARTY RADIO Tuesday and Wednesday nights at 8p est | 7p cst | 5p pst on the GET GLOBAL NETWORK ... See More internet station SoMetro Radio. 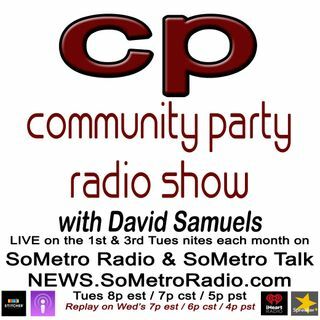 Community Party Radio Show is hosted by author and political activist David Samuels, author of the book False Choice: The Bipartisan Attack on the Working Class, the Poor and Communities of Color. Pick up your copy of the book on Amazon. Community Party Radio Show airs Tuesday nights at 8p est / 7p cst /5p pst and our new time on Wednesday nights at 7p est / 6p cst /4p pst on www.SoMetroRadio.com. You can also hear the show on the iRadio station SoMetro Talk that is available on apps like TuneIn and SoMetro Magazine. SoMetro Radio and SoMetro Talk are original member stations of the GET GLOBAL NETWORK. Take the time to subscribe to the show on iTunes, iHeart Radio, Spotify, Google Podcasts, Stitcher, Spreaker and other podcast platforms.